Lucille B. Gilcreast Beloved sister, aunt, great aunt, cousin and friend; Lucille (Beaulieu) Gilcreast passed away on March 1, 2019 at D’Youville Life & Wellness Community in Lowell MA. She was the widow of William J.
Alice Gertrude Kiernan, 97, died on Saturday December 1, 2018 at the Carleton-Willard Village in Bedford following a period of failing health. She received her Master’s Degree in Education from Boston University. Alice taught at the Bartlett School, a satellite school connected with State Teachers College at Lowell, prior to becoming a professor of education at the University of Massachusetts - Lowell with a concentration in teaching children’s literature. She remained at the University for the remainder of her career. She retired in 1983 with the rank of professor emeritus. 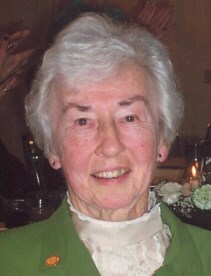 She received awards and recognition from her alma mater, including the Coburn Award for Professional Excellence from the University of Lowell College of Education in 1983 and the Distinguished Alumni Award from the University of Lowell College of Education in 1992 and 2002; and was honored by St. Patrick’s Parish Irish Cultural Committee in 2005 as Irish Person of the Year. She enjoyed traveling and visited relatives in Ireland with her sisters, the late Sr. Mary of the Incarnation (Anna Kiernan) and the late Mary (Kiernan) Howland. She also visited Aruba, Barbados, and other areas of the Caribbean with friends. She lived most of her life in the family home on Phillips Street, in a part of Lowell known as “The Acre” until declining health led to a move to Lexington where she lived with her nephew, John C. Kiernan and his wife, Dr. Brenda Nishimura. After Alzheimer’s progressed to the point where she needed full-time nursing care, Alice Kiernan moved to the Carleton-Willard Village a short distance away. She made many friends there and enjoyed chats over an afternoon cup of tea. She was a member of the Sodality of Mary and a lifelong parishioner of St. Patrick’s Church in Lowell. She was known for her generosity of spirit and inherited her father’s sense of humor and fondness for the Boston Red Sox. Alice was an exceedingly generous person. She faithfully attended several family members in the Phillips Street home during their declining years and assisted other members of her extended family in many ways, large and small. During her final years living alone on Phillips Street, she would be seen out walking almost every day, well into her 90s. She knew and was a friend to her many neighbors, young and old. She was predeceased by her parents and six siblings, Anna G. Kiernan (Sr. Mary of the Incarnation), Mary Kiernan Howland, John Kiernan, William R. Kiernan Jr., Cornelius F. Kiernan and Joseph R. Kiernan, Sr. and by a great grand-niece, Peyton Elizabeth McFaun in 1999. Survivors include eight nieces and nephews and their spouses, Mary Ann McFaun (Francis); John H. Howland, Jr., William G. Howland (Betsy), Margaret Howland-Mastro (Ken) William R. Kiernan, III, Dr. Joseph R. Kiernan (Llynne), Glenn C. Howland (Anne); and John C. Kiernan (Brenda)and several great-nieces and great-nephews, Katherine McFaun Williams, Bennet Francis McFaun, Mary Alice McFaun, Charles Stephenson Howland, Emily Kiernan Proell, Alison Jane Howland, Mariah Donnis Howland, James Kiernan, Erin Kiernan, Joseph Ryan Kiernan, Jacqueline Kiernan and Matthew Kiernan, and a step-great-niece, Vanessa Joan Fatton. Family and friends may call Saturday morning December 8, 2018 at the O’DONNELL FUNERAL HOME 276 PAWTUCKET ST. in LOWELL from 10 to 12 Noon followed by her Committal Prayers at the Chapel at St. Patrick’s Cemetery in Lowell. E-condolences/directions at www.odonnellfuneralhome.com. Those wishing may make contributions in her memory to Alzheimer’s Assn., 309 Waverly Oaks Rd., Waltham, MA 02452. Arrangements by Funeral Director James F. O’Donnell, Jr. (978) 458-8768.